In antiquity, as today, providing drinking water to a growing population in the land of Israel proved to be a challenge, but not an insurmountable one. 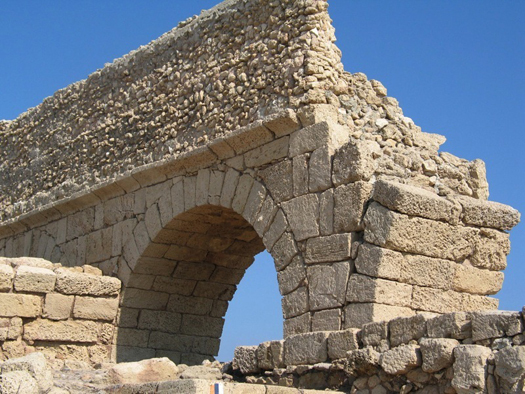 Several types of well-preserved Roman era aqueducts that had brought water from springs on the Carmel Mountains to Caesarea can be found in easy driving distance of each other. If you are taking this tour during the summer, bring a change of clothes and shoes suitable for walking in water, as you will get wet! The first stop on our Israel tour to study ancient water systems is a visit to Ramat HaNadiv Park, about 45 minutes North of Tel-Aviv. Travel in Israel is relatively easy, so from Route 2 follow Route 70 and turn right into Route 4 to enter Zichron Yaakov from the southwest. Drive up the hill, following the signs to Ramat HaNadiv, proceed toward the old town, but at the circle turn right and drive down the hill toward Binyamina. You may wish to begin your tour of Ramat HaNadiv by visiting the beautiful gardens and the Rothschild family tomb. Before entering the Memorial Gardens, stop at the new visitors center to watch the film “Beyond the Gardens”, the story of Ramat HaNadiv or enjoy an alfresco meal at the kosher cafe/restaurant. The map provided at the park’s entrance will then guide you to the En Zur spring. The excavation of the spring and aqueduct by the late Professor Hirschfeld of the Hebrew University in the 1980s permitted water to flow for the first time since its Roman inhabitants enjoyed the spring and baths 2000 years ago. 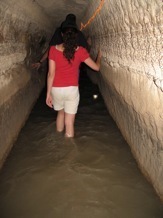 The fresh spring water originates inside an almost 50 meter tunnel, which can be partially accessed by foot. The water runs along a narrow, low aqueduct hewn into the stone and is covered by angled roof tiles, which in ancient times prevented the accumulation of debris in the clean spring water. The water flows into a large swimming pool, which together with the adjoining bathhouse, was built at the end of the 1st century CE and was used by the Roman inhabitants of the hilltop manor house until the great revolt in 70 CE. Steps leading up to the bathhouse make for easy viewing of the beautifully preserved caldarium, which was heated by hot air flowing between the pillars beneath the floor. The spring water was also used to irrigate the lush agricultural area immediately below the bathhouse. These fields were fertilized by pigeon droppings, which were collected in the columbarium, whose circular foundations are also visible near the spring and manor house. Professor Hirschfeld theorized that the entire estate belonged to someone closely associated with King Herod, the builder of nearby Caesarea. After the site was abandoned after the Great Revolt, a second aqueduct was used to bring water from the pool 1700 meters down the hill to the former Talmudic village of Shuni, today known as Park Jabotinsky. The spring at Shuni, as well as the overflow from En Zur, served as the source of the high level aqueduct, a main water carrier for the people of Caesarea. At the park, archaeologists have excavated a theater for the pagan water cult Maiumas, as well as a large 4th CE century pool. The theater and pool are part of a larger complex, which was built by Baron de Rothschild to house an agricultural training center for new settlers of the Betar movement. Decades later, the training facility served as a clandestine officers school for the Irgun, as well as a home base for many of their operations. Memorial markers for these underground fighters can be viewed at Jabotinsky Park as well. Today, the theater serves as an attractive summer concert venue. You can easily reach Park Jabotinsky at the conclusion of your visit to Ramat HaNadiv by continuing 4 kilometers down the road into the village Binyamina. After exiting the park, continue to follow Route 652 toward Givat Ada, turn left into Route 653 and follow the signs to Alona Park/ Me Quedem to explore the Roman era tunnel. You may wish to call ahead to ensure the park is open on the day of your visit (04-638-8622). The 13 kilometer drive from Park Jabotinsky to Me Quedem is one of the more beautiful attractions in Israel as the road meanders through a lush valley of vineyards and fruit trees. Local farmers who had always suspected that a spring ran under their fertile soil rediscovered the tunnel system in 1967. In fact the Romans were well aware of the spring at Ein Tzabarin and carved a magnificent 6-kilometer water carrier horizontally into the hillside. This tunnel then intersected with several aqueducts further down the hill to provide the growing population of Caesarea with fresh spring water. Today, with the assistance of a guide, you can traverse a 280 meter restored section of this tunnel, which most times of the year is about a meter deep. The water carrier is well lit permitting you to observe chisel marks as well as the diagonal piers that permitted the Roman excavators access to the tunnel and fresh air. After returning to dry clothes in the changing room, retrace your drive toward Route 652 and then turn right toward the circle in Binyamina. Proceed under the viaduct and follow the signs to Route 4. Then turn right and proceed north for 2 kilometers to the brown sign “Taninim Springs”. Immediately thereafter a sign will direct you to the Taninim aqueduct at Moshav Beth Hanania. 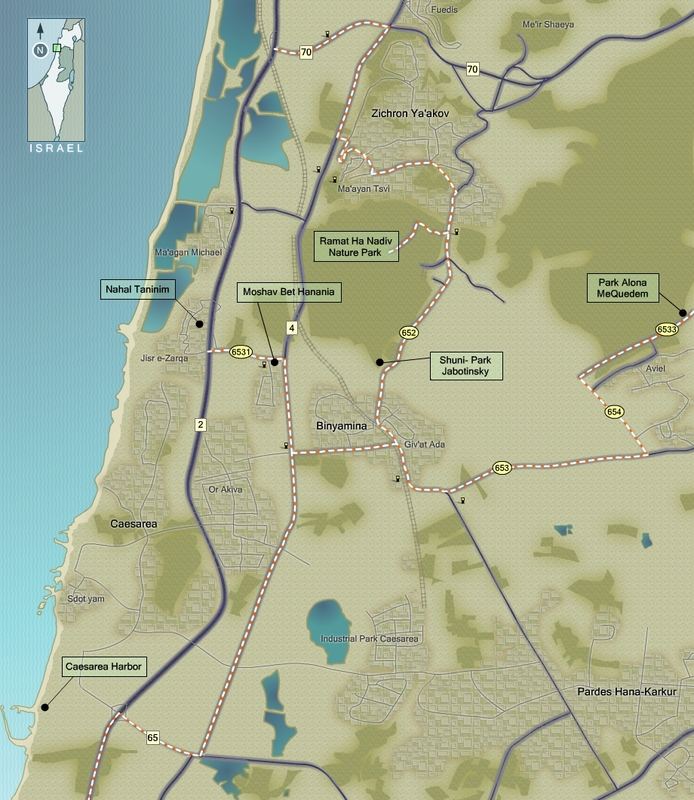 Drive into the moshav, park your car at the front gate and proceed by foot several yards to the right along the aqueduct. In 2010 a new bridge opened at Route 652, near the Ada Junction, to facilitate travel to Route 4. A most surprising find will await you; two beautifully preserved inscriptions from the Roman era. The first is a high relief of the Roman Empire’s 10th Legion with an eagle perched over a wreath, and there under, a Nike standing on a crouching Atlas. 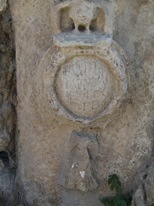 The adjacent stone plaque names Emperor Hadrian, through a detachment of the 10th Legion, as the builder of the aqueduct. The arches of this beautifully preserved high aqueduct carried a second channel parallel to the first built by Herod decades earlier. When this secondary channel stopped functioning , a third channel made of clay pipes was built on top of it, and can be easily viewed near the plaques. The aqueduct can be followed by foot as it meanders its way through the fields of the moshav toward the coastal road, or you can continue to admire it from your car as you drive toward the sea to the entrance of the Nahal Taninim Nature Reserve. There you can observe a low level aqueduct with its sophisticated system of dams and locks that regulated the flow of water to Caesarea. Taninim in Hebrew means crocodiles. In fact it was up to the early part of the 20th century that crocodiles could still be spotted in the river that envelopes the nature reserve. Today, the banks of the river and surrounding wetlands provide the visitor with a cacophony of sounds from heron, cormorants and storks who feed in the nearby fishponds. The Taninim is a clean coastal river, which provides nutrients to the plentiful water lilies, grasses, turtles and fish in the reserve. The reserve ensures that the visitor experiences a wonderful combination of archeology in a peaceful natural setting which can be easily explored by foot within an hour. The Romans realized the benefits of plentiful fresh water in the Kabara valley and accordingly designed various methods by which to channel this water to the citizens of Caesarea, nearly five kilometers away. During the renovation of the preserve, excavators discovered a dam, which utilized three wooden floodgates to elevate the water, and control its flow through the ground level aqueducts chiseled out of stone by Roman laborers. The 200 meter long dam created a reservoir of 6000 dunams, creating a large lake in the Kabara valley with a virtual unlimited supply of fresh water fed by the stream, springs and runoff from the nearby Carmel mountains. In fact the excavation of the area has permitted more than 3000 springs to once more burst into life! But even the Romans were fallible. An aqueduct that leads to no where can be found near the dam and can be explored by younger family members until its uncompleted end. The other aqueducts can be traced by following wooden bridges suspended over the wetlands. As you do so, you will no doubt come across a reconstructed vertical water wheel , the original of which was used by local residents, who had built about a dozen gristmills on the site during the Byzantine period. Another method to harness water in order to move the large grinding stones was developed by the Ottomans. They constructed stone slides which permitted water to quickly flow from the top of the dam down to the flour grinding area. These slides have been restored and can be easily viewed on the side of the dam. In the early part of the 20th century, Edmund de Rothschild purchased much of the surrounding land and constructed a pipe factory near the Roman quarry. Though the purpose of the project was to lay thousands of pipes to drain the swamp, the effort failed. Today you can view some of the remaining pipes at the quarry. You can end your visit to the Taninim Nature Reserve with a walk over the dam where you may see children from the nearby Israeli-Arab village splashing in the stream, fishing or grazing their livestock. From Taninim it’s a short drive to Caesarea to view another portion of the high level aqueduct visited at Moshav Beth Hanania. 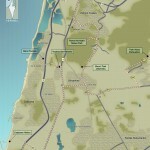 Return to Route 4 and drive about 10 kilometers in the direction of Tel-Aviv. Turn right at Route 65 and head toward the sea following the signs to Caesarea harbor. Once inside the residential community, brown signs will direct you toward the aqueduct. The aqueduct remains a most imposing structure with its series of arches set in the sand against the backdrop of the blue Mediterranean. You can explore the beauty of the aqueduct by walking its length until it once more becomes buried in the sloping sand dunes. If you look northeast toward the Carmel mountain ridge you can just imagine a very long row of arches that carried drinking water to the residents of Caesarea and the marvels of Roman engineering that achieved this feat. If time and energy permit, you can complete your day by touring the Caesarea National Park, immediately south of the aqueduct. The site is certainly a must-see stop during your trip to Israel. Travel in Israel is relatively easy. Just follow the brown signs in Caesarea directing you back to Route 1 toward Tel-Aviv.